When you think about searching online, you think Google. When you think about colored sticky notes, you think Post-it. And when you think about binge-watching series and movies you think of……right: Netflix. Netflixing has become synonymous to binge-watching. Netflix is an inspirational example of a company that successfully shifted their business model multiple times and grew exponentially because of that. They started with renting boxed products through a mail service nationally (in the US) and shifted to delivering on-demand entertainment catering to diverse needs globally. The ‘all you can eat subscription’ that Netflix offers, lets you watch your favorite shows anywhere and at any time you want. It all began in April 1998, when Netflix started renting out DVD’s by mail. Only a year later Netflix changed its pay-for-use model into a subscription model. Nearly a decade later, Netflix changed their proposition to a streaming service, which changed the way millions of people spend their free time. There are new entrants in the market, such as Amazon Prime, Hulu Plus and Facebook Watch, yet Netflix is by far the leader, serving 125 million customers and generating 11.7 billion in revenues in 2017. What did their innovation journey towards this success look like and what is driving the exponential growth? Let’s explore how Netflix shifted their business model in order to grow exponentially. When software engineers Reed Hastings and Marc Rudolph founded Netflix in 1997, video rental stores dominated the home entertainment market. Hastings was frustrated that the market was not customer-friendly, with charging the customers high fees for late returns as the culprit. They saw an opportunity to do rentals differently and Netflix began renting out DVD’s by mail in April 1998, which was a game changer in the video-renting market and a huge gamble, there VHS dominated the market and only 2% of the American households owned a DVD player at that time. Reed and Rudolph knew if the market reached 20% of households, they would have a viable business. They had the foresight to take the leap and their vision was right: eventually 95% of all households had a DVD player! The first business model was to let people rent videos by selecting it online and having it delivered to their door. This service was unparalleled at that time and a big shift in the industry. A year later, Netflix introduced a subscription model, where customers could rent DVD’s online for a fixed fee per month. When Netflix launched, Blockbuster (a global chain of video stores where customers could go and rent videos in store) was their biggest competitor. It took Blockbuster years to start offering a similar service as Netflix was already doing. By the time they finally shifted to a subscription service, Netflix already had started the process of shifting their customers to streaming subscribers and was quitting the DVD rental business. From the launch of their subscription model in 1999, Netflix gained 239.000 subscribers in its first year and went on to build a customer base of 1 million subscribers by 2003. As of today, Netflix is by far the number one online player of series and movies, with 11.7 billion revenues in 2017 and 125 million customers who all pay a monthly fee. Furthermore, Netflix’s business model has evolved into a service based, nonlinear model. How did this happen and what is driving the exponential growth? Data driven: not only used for recommendation but also pro-actively used to create content that fits personal preferences. There are nine building blocks to create exponential growth. You can find more information about the nine building blocks here. Netflix made use of all these buildings blocks to grow exponentially, but there are two things particularly interesting to point out. One of the most important reasons that Netflix became an exponential business model is that the founders had the ability to look as an outsider at their business model. They were never happy with the way the business model was at a given time but were always looking where the market was headed in 5 to 10 years. They combined several building blocks for exponential growth by always looking for new ways to solve problems for many customers, to do this with digitalized services (an info based offering) by using a lean approach. For example, Netflix accepted already in 2007 that the DVD rental business was not profitable enough anymore. They understood that people not only want to rent videos but also want to pay for a large and user-friendly offering, for the comfort of ordering a video from your couch and for no hassle with returning videos. They foresaw the change, used their IT-background to create fitting digital solutions and rolled it out in a lean way. Also, apart from being one of the pioneers of the industry with their subscription model, the value proposition is yet another element which helped this particular service to become as popular as it is today. In fact, there are a total of four elements that are making all the difference. 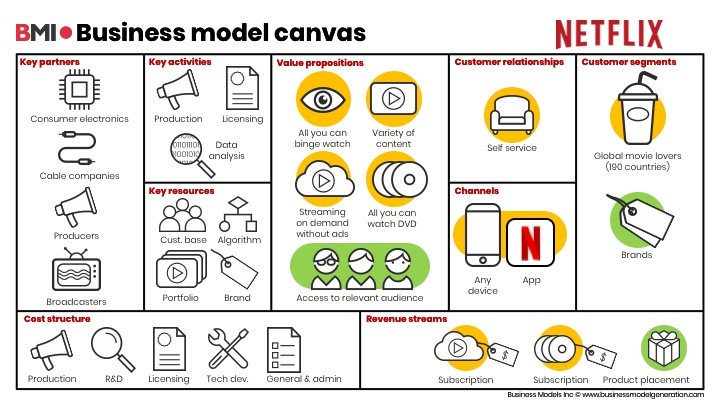 Netflix combined several building blocks to create an exponential business model. They kept and keep changing the components that needed to change in order to grow exponentially. The seventh building block of creating an exponential business, Algorithm to the core, is one that Netflix has played out perfectly. Netflix started with a basic rating system, based on Big Data and completely based on how good or bad a particular movie or show had been rated. These ratings were based on number of views, customer feedback, if videos were watched until the end and even IMDB ratings. When Netflix evolved their business model, an important part of this was to gain more insight into their customers’ preferences and create a community of fans with fitting content for everyone, at any time. They evolved their algorithm to an open source initiative because they understood that with more data and the technological knowledge of more people, the Netflix experience would become much better. Already in September 2009, a prize of $1M (called The Netflix Prize) was awarded to team ‘BellKor’s Pragmatic Chaos’ for improving Netflix’s recommendation model. In 2013, Netflix started to develop their own production and shows, based on the analysis of their own customers’ data. This way, Netflix understood way better than their competitors what their customers would like next and acted upon this. House of Cards was the first big Netflix Original that was made this way. Where studios were only wanting to make a pilot, Netflix already knew based on their data, that this series would become a hit and immediately signed up for two seasons! They currently make use of and contribute to a large number of open source technologies and even have their own Open Source Software Center. In 2017, Netflix open sourced Vectorflow in 2017, which is a deep learning library. All these elements above were combined and led to the current business model of Netflix. The Netflix model keeps evolving and changing the entertainment industry. In December 2017, Netflix rolled out a new recommendation algorithm that knows which image will make you click ‘play. It serves up unique images to its 100million plus customers. For example, when you have watched mostly romantic movies in the past, Netflix will show you an image of the two lead actors kissing, while if you are more into comedy, you’ll likely get a shot of a funny character in the movie. This is only one of the things that are ahead of us. The paying for services could further develop into paying for usage, as this is something how the customer can get an even more personalized offering. You could even get a construction where as a viewer you pay in millicents per second. Blockchain technology will make it possible to support such a structure with lower transaction costs. Also, as Netflix gains more and more insight in how they can make use of all their data, they will probably move even more from a platform to a movie-studio business with data driven formats. Large players in the media field become content sponsors. Even Barack Obama signed a deal with Netflix last week. Traditional production companies are already working together with Netflix to produce original content, using traditional production methods but skip traditional broadcasting methods and instead release directly to Netflix. TV-channels will likely vanish and even Hollywood could in the future release full-length films to Netflix directly, where Netflix subscribers can pay an ‘early bird’ fee to watch the movie. Netflix is very successful because they exactly know what customers want, when they want it and on what device. Also, the company is bold and courageous enough to keep changing their business model into the most optimal future and not afraid to cannibalize their current business model. We’re very curious what their next game changing story will be!